The recurring theme from last week is quite remarkable. Last week, we had a visit from the Devil, which is a major arcana reflecting life lessons beyond our control. This week, we see the 8 of swords that is a minor arcana that highlights how our entrapments are all within our control. This week we should apply unconventional wisdom to push ourselves out of a situation that seems stuck. How else can we remove self-sabotage, self-imposed limitations, blinkers? If we look at this card closely, we see a castle behind the female figure. But she can’t see it because she has not removed the blind and ties that can be easily taken off. The swords around her can also be moved out of her way. 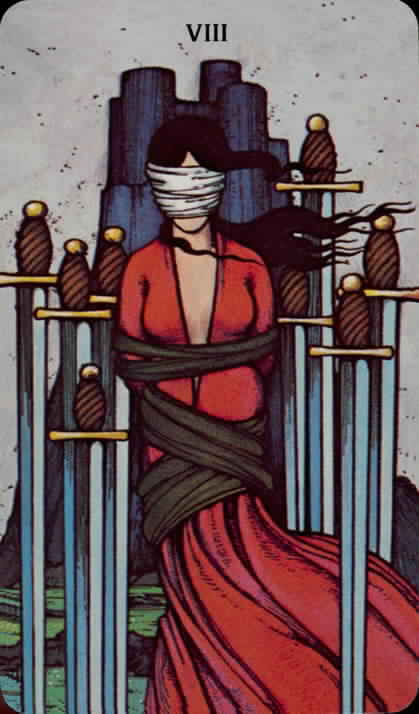 She can use the swords to cut the loose ties off and free herself. It requires an action. It requires a change in mindset. She is not as stuck as she thinks. The obstacles are within her control. Perceptions are misleading. The castle represents a dream or goal, achievement, fulfilment, stability. How can you free yourself to get to the castle?